My new Lodge 3 quart covered cast iron Dutch Oven arrived last week and I used it this past weekend to make all these wonderful soups and stews you have been seeing here at Welcome Home. I wanted to try it out first before I told you all ab...out it. So, what do I think of it? I LOVE IT! 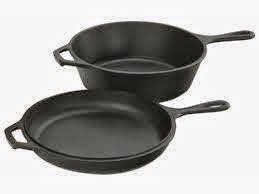 It's a 3 quart deep skillet, a fryer, or a 3 quart Dutch oven, and the lid converts to a 10 inch shallow skillet or griddle or a lid. I used it this weekend to saute my onions and garlic and any of my vegetables for my soup and then flipped it over and used it as a cover while my soup simmered on top of the stove. How handy is that? This combo cooker is great for starting things on top of the stove and putting them in the oven covered. Like a roast chicken or pork chops or even steak with that outdoor grilled taste. I plan to use mine for everything! Of course it is pre-seasoned rugged cast-iron that heats slowly and evenly and just like the skillet that I feature here sometimes I couldn't be without it in my kitchen. 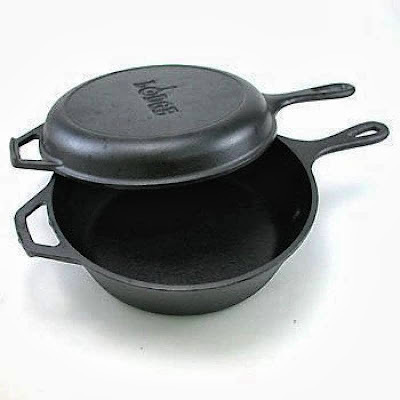 It is a perfect compliment with my new 12 inch cast iron skillet I use for frying everything and my Mom's old 10" inch skillet that I used to make the perfect cornbread. You can use it with a variety of heat sources. At home in the oven, on the stove, on the grill or over the campfire. You can use it with gas, electric, induction and ceramic-glass top stoves and ovens. Seasoned cast iron is great on the grill or outdoor fire and coals for camp cooking. The price is fantastic at only $37.99 for all Welcome Home fans while supplies last. Remember, the proceeds from anything you buy here at Welcome Home using the special Amazon code, goes to the NO KILL Advocacy Group to save the lives of dogs and cats who are killed unnecessarily while waiting for a home. If you look at the link you will see Welchome08 is there to let Amazon know you are from Welcome Home. Click on this link for more information and to purchase.....I think this is a fantastic buy! The new link has now been added and updated.